And yes, people definitely ‘got it’ that most of the existing EA tools are designed only to satisfy the needs of the ‘easy bit’ at the right-hand end of the Squiggle, and that we therefore needed tools that will work with the rest of the Squiggle as well. ArchiToolkit: Idea was free sketch/canvasses which could be then constrained/mapped to formal metamodels if required. Going from sketches, inventory making, process capturing, <anything> to ArchiMate, for example. Perhaps semantic reasoning. ArchiToolkit: The whole “sketch” and “canvas” thing in Archi was never really developed beyond POC stage, effectively. So again, let’s make this happen. 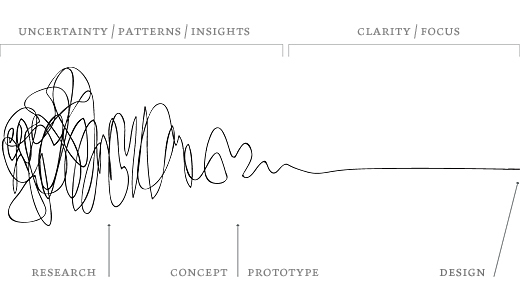 Let’s take it past just a proof-of-concept stage, and build towards something that will link all the way across the Squiggle – from ‘messy’ experiments and explorations all the way across to formal-rigour, and back again. And that’s our first requirement: any entities in any models from any part of the development-process can link together with any other entities. It’s not as hard as it might sound: it’s not that we need a single tool to connect across all of that space, but a unified toolset – which is not the same requirement at all. Agreed that it’s simply not feasible (not yet, anyway!) to build one tool that could cover everything from free-form scribbles to every type of formal-rigour, usable across every part of the toolset-ecosystem; but as far as I can see, it is already feasible to build a set of distinct, discrete tools that can also work together in a unified way, as a platform, to make that kind of interconnection possible. Of those, the data-interchange file-format and the editor-specification format must be open and non-proprietary – otherwise we’ll be little better off than we are already, with the current mess of incompatibilities between proprietary file-formats. The other two parts – the underlying data-model and the apps themselves – can be either proprietary or non-proprietary: I’d very much prefer to see a complete open-source implementation, but ultimately it may not matter all that much, as long as we have access to the sharable data and the means to make sense of it. Of these, probably Topic Maps represents the closest fit to the conceptual level of the data-needs as I understand them. I acknowledge that a lot of people have been pushing me towards RDF/OWL, but I still don’t think it’ll do the job – not least because of its requirement that every relationship is binary, whereas I suspect that we’re quite often going to hit up against true n-tuples. As I see it at present, the data-interchange format is an expression of that nominal data-structure, including the links between entities, as appropriate. As per above, it’ll probably be implemented as some variant of JSON or Topic Maps – or that’s my understanding at present, anyway. The basic text-only format alone would be sufficient for forms-based editors; for editors that use graphics, we could probably include the graphics by reference, via Markdown links or some such. What I’m particularly trying to avoid is bundling low-level code as part of the editor-definition itself. The first three parts of the definitions are pretty straightforward: they could easily be described in a JSON-like format, though preferably made somewhat more readable and commentable as a ‘literate’-type format, as per above. The view-definitions part, though, is not straightforward, and I’ll admit I’m still decidedly struggling with how best to make it work. Conceptually at least, it’s straightforward enough for forms and for basic graphics, but the language-structure I roughed-out a couple of years back – somewhat like an event-oriented variant of the classic HyperTalk language – may not be able to extend far enough to support an equivalent of what Archi can already do with Archimate or the like. (I do have some ideas on this, but I need to talk them through with someone more competent at language-parser development than I am.) The challenge is still to do all of this without requiring direct access to low-level code – in part because anything that directly accesses low-level code is a security-risk, or can at the least screw up both view and data, but in part also because the huge range of user-interfaces and interface-capabilities across the toolset-ecosystem pretty much mandates at least some level of abstraction. The only way out that I’ve seen so far is to build, in parallel, code plug-ins that are independent of any specific editor, but whose functionality can be called-on by editors. The analogy is sort of somewhere between a conventional ‘require‘-statement (a kind of declaration in the core-definitions section of an editor-definition that this editor needs that code-module, and won’t run without it), and/or a FORTH-style ‘word’ (which would then expose one or more new keywords that can be used in the view-definition scripting-language). These code plug-ins, however, would not be user-definable – at least, not in the same way that the editors are. They need to be understood as part of the code-base, rather than the editor-base: I can’t as yet see any viable way round that constraint. As per all of my other stuff around Enterprise Canvas and the like, I’m assuming a concept of ‘everything is a service’, with service-activities triggered by events. On one side, there are event-responses specified in the editor-definition; on the other, I’m assuming a standardised cross-mapping between actual user-interface metaphor (keyboard/menu/mouse, touch-and-gesture etc) and nominal interface-function, such that editor-definitions would work in the same way (as far as practicable, anyway) on whatever actual user-interface metaphor applies on that part of the toolset-ecosystem. 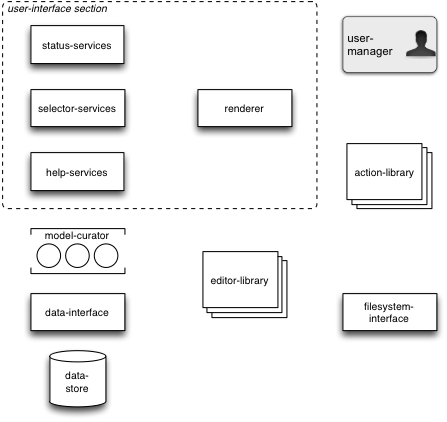 It’s the task of the renderer and the selector-services to make sure that the right event-triggers are in place for the user-interface to enact as required, and for the editor-library and action-library to respond to as appropriate. That’s the basic ideas so far for the architecture, anyway: over to you for comments and suggestions, if you would? Interesting topic, 3 years ago I created an outline design for an EA tool, which had three distinct layers. Base layer was driven by an ontology, which enabled you to import your own dictionaries/data from any source, and convert into an ontology. Funny enough I met a company who had that bottom bit. Believe it or not they imported the entire Aris database into their ontology convertor (in front of me in minutes). The second tier is a modelling viewer, with text auto complete. Basically content of any model is driven by the content of the ontology, this enables local language. Also removes the need for QA and inventing terms people don’t know. The third tier was a google type search tier, which would enable people to search for content (models and content from the third tier) they were interested in, and users were returned the options (like google), to view as images, text etc.. The third tiers goal is to solve the issue that all EA tools suffer with, getting the content out easily, without the aid of a vendor. Also content must be driven by conditional formatting, which enables you to create views based on different stakeholder needs. The tool also enabled designers to model the service design aspects and plumb into the business and technology delivery (full iPad design support). Giving full outside in and inside out alignment. What we’re finding – just as you did – is that lots of people have single parts of the puzzle, often really well resolved (as in your example of the ontology-importer). What’s missing is something / someone / somelotsofpeople / somewhatever to link all of the pieces together into a unified whole – or at least unified enough that multiple and useful pathways through that whole become possible. I’ve been nibbling-away at this for more than a decade now, and likewise have had quite a few talks with vendors over the years, but none of those discussions have ever really gone anywhere beyond polite expressions of interest. I can understand why, I suppose: it’s often very much not in vendors’ interest that the joined-up-whole should exist, unless they themselves control the entirety of that unified-whole – which I don’t think would be possible, given the technical and human-skillset constraints. On ‘real-time modelling’, it does sound like you’ve been addressing a (yet another) different aspect of this unified-whole: talk somewhen on this, perhaps? And yes, whilst we’ve certainly been “too far ahead for the times”, it’s possible that at this stage it at last “might just be right”. 🙂 Let’s make it happen this time?